The Suzuki Burgman Street has launched in the Indian markets today. It is a premium maxi-styled 125cc scooter which is priced at Rs 68,000 (ex-showroom). Through this article, we answer whatever questions you have about this scooter. Read ahead to know more details. The much awaited Suzuki Burgman Street 125 cc premium scooter has been launched in India. The maxi-style scooter gets a price of Rs 68,000 (ex-showroom). Currently, Suzuki has only 2 scooters in the lineup, the Access 125 and the Let’s. With this, Suzuki steps in the premium 125cc scooter segment. First, we shall explain what a ‘Maxi-scooter’ is. Usually, these type of scooters get large front aprons, unusually placed handlebar and a descending seating arrangement. The first maxi-scooter in India was the Kinetic Blaze and the recent one was the Honda Cliq. The scooter comes in three colours – Glass Sparkle Black, Pearl Mirage White and Metallic Matt Fibroin Grey. In this article, we help you with all your doubts regarding the Burgman. When is it launching in India? It has been confirmed that the Suzuki Burgman Street is launching on 19th July 2018. It was a much-awaited scooter. After its launch, the Suzuki scooter lineup will now have 3 scooters. What is the price of the scooter? The exact pricing details are not out yet. However, various scoops have suggested that it will be priced at Rs 68,000 (ex-showroom). Other scoops have also said the scooter will cost around Rs 76,000 on-road. If this is the confirmed price range, then the scooter could be a good catch. What are the design highlights of the scooter? The 125cc scooter looks simple, but the design which it gets is new. Maxi-style designing means large front aprons with a weird-type placed handlebar. This scooter gets a maxi-style design, last seen in Kinetic Blaze and currently seen in Honda Cliq. In the front, it gets Dual LED headlamps below a large windshield. It copies the LCD instrument panel from the Gixxer. In the rear, it gets LED tail lights with big side rails. What are the specifications of the scooter? The Suzuki Burgman Street 125 will use Access’s same engine. It gets a 124cc air-cooled single-cylinder engine. The engine churns out 8.7 BHP @ 6500 RPM of power and 10.2 Nm @ 5000 RPM of peak torque. It weighs 110 Kgs which is heavier than the Access. It gets a Telescopic suspension in the front and a single shock absorber hydraulic at the rear. For safety, it gets front disc brakes and rear drum brakes. What is the mileage that you can expect from the scooter? The mileage figures of the scooter are estimated around 45 KMPL. The fuel capacity of the scooter is around 5.6 Litres with a reserve fuel capacity of 1 Litre. The riding range of the scooter is estimated to be around 250 Kms. This mileage is ideal for a 125cc scooter, as most of the other scooters also give similar figures. What are the features of the scooter? Suzuki has equipped this beefy boy with the segment features. Most of the features are available in its contenders, but the main distinctive feature is its maxi-styling. 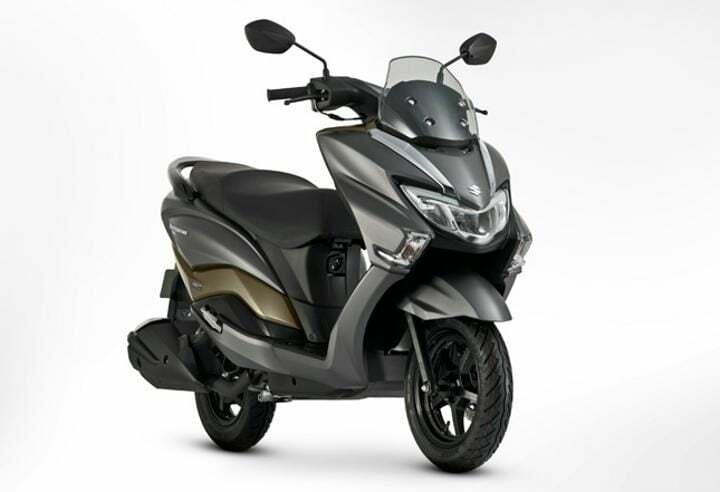 The features of the scooter include a Fully Digital LCD Instrument Cluster, LED headlamp unit, charging socket, multi-functional key, Large Apron and front Windshield. The safety feature is a disc brake in the front. The global version of this scooter also gets ABS, but the Indian spec misses this out. Who all will the Suzuki Burgman Street 125 compete with? Well, well, well. The 125cc segment should not be taken lightly. Especially, when we have two giants edging out against each other. Suzuki Burgman Street could be the third giant too. The main rivals are Honda Grazia and TVS Ntorq. One is reliable, but one is tech-savvy. Ntorq gets much technology like GPS navigation, call and notification alert, lap timer and much more. Seen for the first time in any scooter. On the other hand, Grazia plays it cool with Honda’s reliability and good after-sales service.